It seems like forever ago now, that we were all meeting up to celebrate the end of another year, and yet for some that moment was still to come. That was certainly the case for Robbie and his group of football mates. They’d all had such busy schedules over the Christmas period, that they never did get the chance to meet up and celebrate together, even though they’d been saving up a kitty. So as January was drawing to a close they decided that now was the time. They’d had enough of loud bars and clubs, and opted instead for a more mellow approach, with Robbie offering to host a dinner party at his home, that was big enough to host all fourteen of them, and they chose the team at Taste the Cracklin to provide one of our famous hog roasts. Dinner was to be served over a night of European football on the television, and so timing was crucial. There were two matches being played, an early game at five thirty, by which time the boys wanted a selection of canapes to be available, and a late game at seven forty five, by which time they wanted to be sitting down with their hog roast. In order to be ready for both kick off times, the small team from Taste the Cracklin, consisting of our chef and our catering assistant, had arrived at Robbie’s house by twelve noon, and had the hog roasting, and prep for the canapes well underway within the hour. Guests began to arrive at around four thirty and food was served at five. Among the options were our Mini Pizzas topped with sliced Greek olives, our Mini Homemade Beef-Burgers and our Spicy Thai chicken Kebabs. 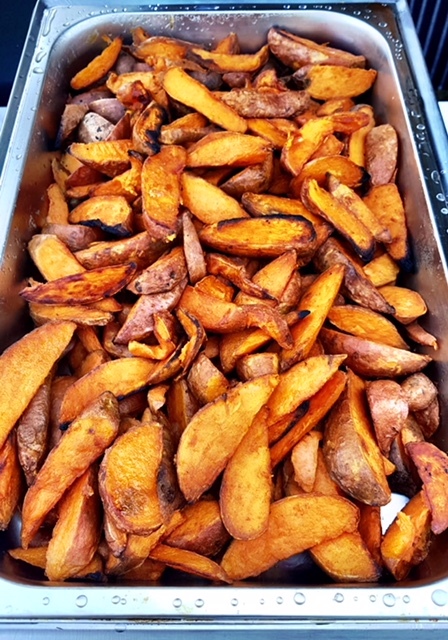 The Hog Roast buffet, accompanied by Cajun Spiced Sweet Potato Wedges and seasonal green leaf salad, was served at seven thirty – just in time for kick off. After dessert was served – a chef’s special, Sticky Toffee Pudding, served in time for the second half – the team at Taste the Cracklin tidied away discreetly, leaving their guests to enjoy the match.